Comments on "On the Street.... White Base for Color, Soho"
This works for her, but I'm not a fan of the shapes here: such a big skirt and long sleeved t-shirts... I do like the idea of breaking white with rainbow colored accesories. Beautiful, so pure, almost angelic! Her hair and skin is illuminating. This is glorious. And look at her lovely smile! the skirt is just the right length, not dragging on the ground. that pop of color is genius! that's a beautiful scarf! I would like it more if her skirt was shorter. A very beautiful scarf on a lovely girl. Love it! The colors are so fresh, and the white makes the colors pop. I love the bracelets also. What a beautiful photo. Her smile is just wonderful and I love the outfit. all i can say is WOW. love love love this! I love this image. Very inspirational. I might not be so afraid of white, now. I'm also amused at the cyclist. I love the man on the bike..... Wha what what are they doing???? One word when I checked The Sartorialist this morning: WOW. Beautiful! So fresh, so happy, so summer! Love this look. I'd like to post this pic on my blog if you don't mind (crediting you of course!). Just lovely. There's nothing better then well used white. I love it, I feel Peaceful. I love it. I feel PEACEFUL. This is a typical example for something looking very good, but not funcionate at all. The guy on the bicycle behind wears a simple T and this lady has also a flip-flop on, so it was surely not that cold for this warm shawl. That's a really wonderful scarf! I wish I had it! Scott, this is wonderful. White is so springy. And I love the guy looking back and her/you. Fantastic shot, as always. Very happy look! Very etnic and she looks radiant! The flip-flops and the bracelet are an excelent complement. She's a head-turner, as evidenced by the man on the bike! What I like is that she didn't junk up the whole out fit with scads of accessories around her neck in addition to the great shawl. I love the bracelets --just a nice touch. Maybe she should consider getting the skirt shortned by and inch so it doesn't become completely ruined by dirt. Also... some nice brown leather sandals would be better than flip flops. I really like how the white conveys a quiet field for the color to float upon. Nice how the color in the scarf matches that ground pipe too...lucky break? She looks gorgeous! Sharp yet comfy. I love it. The look is great. Plus there's the bicyclist looking back at her (or you? more poetic if it's her, though). The lighting is fresh and quite appropriate. All around, a job well done! Thanks for the detail shot, too. It's a nice touch. She is lovely. Beautiful contrasts in color and texture. Well spotted and nicely shot. totally beautiful and perfectly weather appropriate. shawls are great items. i wish i could wear head to toe white, but i drink too much coffee and red wine for that to be practical. Nice little rainbow wrap around virgin white. Striking and original - she looks wonderful. I love the contrast of detail. We live in a truly multi cultural city yet so rarely have such exotic and beautiul reminders. There are so many things to love about this outfit! I love how the gathers on the shirt are running opposite to those of the skirt. I love the vibrance of the colors. They're already so bright and then they are vamped up a few notches with the white background. I love the bohemian Y ethnic feel with both the pashmina and the broomstick skirt. I love her hair. I love the cycle cop peeking back to see what's going on and the red fire hydrant that matches her colors' vibrance. The brightness of the sun does make me think she's going to get dismally hot, but she just looks so pretty! And the white hot rays match her outfit. Wow! Both the scarf and beaded bracelet are hand-made here in Cusco, Peru. Nice to see a touch of the Andes in NY! Haha, I love the guy in the background on the bike looking at you like you're insane. i actually have that scarf, or one that's strikingly similar - in weave, shape and colours. weird! i think it's still fair to say it's *almost* a one of a kind though...it's alpaca wool and i got mine in puno, peru. i want to see her standing infront of the UN as a symbol for peace between all people. gorgeous- but I hate to see that pristine skirt scraping on the gritty NYC ground!! Flawless. White on white has been a look that I've advocated for a long time. The shawl adds just the right accentuation to the white and to the tones in her face and hair color. The bracelets are a polishing touch, completely in character. She looks like a clear crisp summer breeze. I can picture how beautiful the skirt and scarf move when she is walking down the street too. She is a radiant child; strong, ethereal, and wildly monastic. But as beautiful as she is, there's something still awkward about the floor-length skirt in pure white-- maybe because it's too formal in appearance to match it with the white top? I think she would be perfection if the skirt was knee-length. oh no! flip flops aren't real shoes -- where are here balenciaga booties??? but seriously, love this look. I think the length is perfect, the unbroken white makes her scarf pop even more. Brilliant! That bicyclist is a wonderful touch. When I was younger I made of the mistake of thinking that to look distinctive or interesting I needed to dress strangely (which for me meant thrift shopping, Victorian jackets & heavy shoes). The thing I LOVE about this ensemble is how distinctive (and attractive!) it is. But there's not a single shopping choice she's made that lies outside the mainstream (well... except for the rainbow wrap). White tee? Ubiquitous. Broomstick skirt? Banal. Flip flops? Same. Rainbow scarf? Hippie dippie (yet but by pairing it with white she's made it not). What a wonderful expression of delight in color, creativity and individuality pulled together from the everyday. An inspiration. Thank you. I like this because "It's her" she's being who she is, herself. No effort, very happy, natural. I like the 2nd detail shot. Brilliant weaving on the scarf/shawl, looks to be by hand. I love the simple beads, they most likely have meaning to her, a story that she's a part of. Nice natural hands. Thank You. o nice.... i love the serenity of this moment. and the biker to her left is pretty funny looking. Love the look of the cop in the background checking you out! As for the look,well she can get away with anything! Love the detail shots you have been posting lately! Fantastic shot and what a great smile. I don't suppose you found out where she got that great scarf? Am I the only one concerned of how HOT she must have been? It certainly helps that that's the most beautiful scarf I've ever seen. It's OK, though I am really not that enamored by the look. That is so unbelievably fresh, especially for NYC, a place that I associate with industrialism. She is glowing. It must be warm in NY by now,so it makes me wondering why the heavy scarf? The white l o n g dress works well for a bride,but doesn´t the helm of it get dirty worn on the streets? A nice looking girl though. I actually purchased the exact same scarf on a trip to Peru last month! The markets were full of beautiful things like this at amazing prices! I was thinking I would have to wait until next winter to wear my scarf, but it clearly works now when worn like a shawl. Great picture! I keep getting distracted by that man in the background. I hope he falls off his bike, becuase instead of looking at where he is going, he is butting into other people's business.It's New York people, not the living museum. Strange how a natural look can come out so unnatural. In my opinion, it feels too done, too calculated. However I appreciate the effort to communicate a peaceful atmosphere. It's fresh and it's different, I love it. THAT IS MY STOLEN SCARF!!!!!!!!!!!!!! As an ex-goth, determined walker, and magnet for stains, I am frightened of all-white. But I bought a glorious vintage Gunne Sax cotton slip that I've been trying to figure out how to wear without being so stark. And so, I am inspired! Cheers. I love the bracelets! Très Chic! it's fresh, simple and great! Am I the only one who thinks the skirt is too long and white for city wear? It looks like it can drag on the sidewalks. awesome use of colour. the intensity of colour in this outfit is electrifying and dangerous [for the boy on the bike]! I almost wept. (It's been a long day...) What simple,clean ,happy beauty. I think maybe the skirt could be just an inch shorter, but to be honest, I like every thing about this outfit. Even the white flip flops. 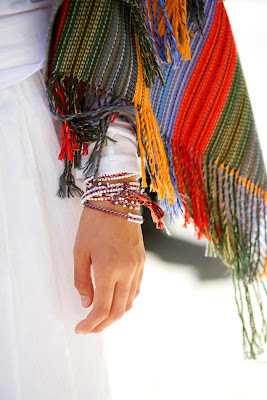 I just LOVE the use of color here, in the bracelets and Peruvian scarf....it's not too much but just enough to bring such life into the photo...especially against the white clothing! 3. even the guy in the background is wearing white! 4. that fire hydrant thing really picks up the red. i love you scott! i don't know what i would ever do without my daily dosage of your blog. This is by far the best female look you have ever featured on your blog. Tiffy, your stolen scarf may have been hand made, but that doesn't mean it was the only one of its kind. Obviously, if someone could make one, they could make another. Sart, this is my favorite post of yours in a while. Lovely. Totally modern, pure and free. Brilliant! It must be the love you are feeling that keeps your smile radiant. anyhow, i think it's an ok look but i don't love it. as others have mentioned the skirt is long and for me the overall look is too simple. this is perfect. the beautiful thing about it is that it wouldn't work for everyone, but works so well for her. Color wise its genius, like strokes of a brush on a canvas. But ponder this. What if the canvas isn't a cute asian girl but an average obesses middle aged woman. You can dress a beautiful person in a potatoe sack and they would still look appealing. Love it, this is how I wear colour. I love a floor length skirt too, the silhouette is great, really flattering. Who cares about the flip flops? You guys all seem to have a thing against them. I just want to know why people wear them here (Australia) in winter, but with scarves and coats. This is beautiful! The Scarf is fantastic! Simplicity is the best look of all. i love the andean bracelet. she looks as if she just got back from a trip to bolivia and peru and is still feeling the hippy vibes. It's so simple and so compelling; that, in my opinion, is the essence of genius. Love her, love the modernist vibe, love the colorful flair. It's brill, and no mistake. love love love this. dream like! Love it! Not a label in sight and still blows everyone out of the water. Ohh, I feel so inspired. This is so lovely. She looks so peaceful and symbolic. There is such simplicity in her outfit yet it looks wonderful! I can just imagine her walking down the streets in New York, turning heads, with lots of those skimpily dressed people wondering how she can look so good and show so little. This is my favorite thing I've seen on your blog since I discovered it a month ago. All those colors against the bright white - I would LOVE to wear that! what a beauty! I love everything about this photo! fresh-looking, but could give a person eyeglare on a blazing day. good strong colours.. but is that a sofa throw?? Skirt length isn't very practical for NY streets, is it? perfection. this woman has executed her outfit as an extension of her personality. of course the color contrast and balance is transcendent. unlike others i believe the lengths on the underlying white garments are beyond reproach. look, it may not be practical, and at the end of the day her hem may be soiled. we'll never know. but the fact is that sart caught her on the street and for all the impracticality of it her hem wasn't soiled in the picture. somehow she brought the improbable perfection of a studio shoot to the sidewalk. thanks sart. wish i was there, but i'm glad you were. She's adorable! However, I echo the others in that such a full length, volume-heavy skirt and scarf overwhelm someone as petite and slim as she is. I love this, for one reason, the man on the bike behind her is so starring. I like to think he is star-struck b the beauty, its quite romantic. Very "Memoirs of a Geisha". This is lovely! My favorite use of white in a very long time! my God she is gorgeous. I love the outfit with the colorfull scarf and her big smile brings it home. i do like the purity and lightness this girl seems to emanate (it is rare indeed)...but the outfit i do not like and would never wear. i love the scarf's material! anyone who has been to peru will recognize the scarf and bracelet, i have them both! love the wrap for this chilly spring. Love the colours, the scarf, the bracelets, and her own beautiful colouring. However, the dress itself is just too much dress. She looks gorgeous. This is why I love NYC.